Designed to fit on most airsoft tactical vests, caps and uniforms with hook and loop attachments. Great for combat simulation, scenario war gaming, costumes, and movie prop use. IFF Flags identify friendly individuals to prevent friendly-fire. IFF flags with hook and loop are often placed on helmets, tactical vests, backpacks, caps, BDU's, etc. Established in 2001 for Airsofters by Airsofters. Team Matrix thrive on the vision to better the sport of Airsoft with affordable high quality Airsoft equipment. With decades of experiences as Airsoft enthusiasts ourselves, we live, sleep, and breathe Airsoft. Matrix offers a wide selection of skirmish grade replicas from rifles to pistols, a wide variety of accessories, and tactical equipment from helmets to boots. It is the Matrix mission to prepare every Airsoft shooter the perfect experience! 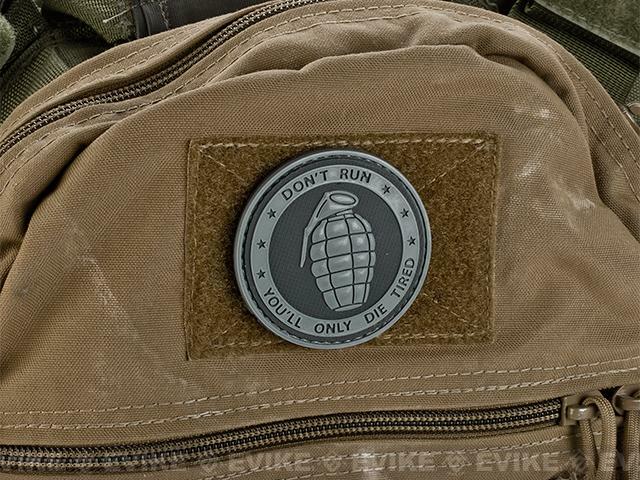 Discuss about Matrix PVC Hook and Loop IFF Patch - Don't Run, You'll Only Die Tired Grey with your friends and fellow Evike.com shoppers! PVC IFF Hook and Loop Morale Patch - "Angry Smiley Face"